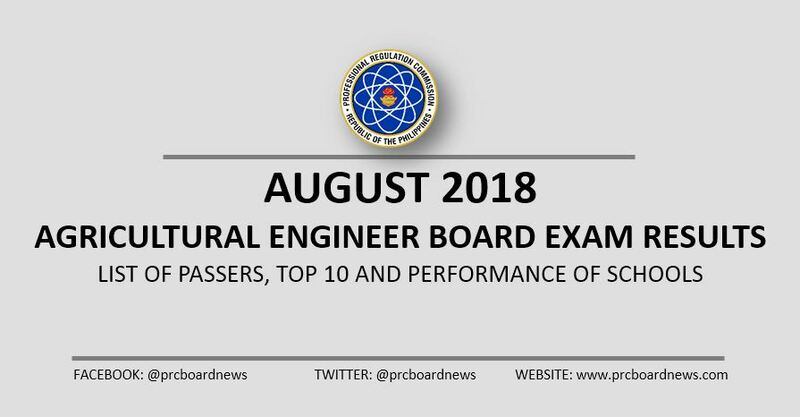 MANILA, Philippines - The Professional Regulation Commission (PRC) released official results of August 2018 Agricultural and Biosystems Engineer board exam, which include the full list of passers, topnotchers (top 10), top performing school and performance of schools on Tuesday, August 28 or in two (2) working days after the exam. As announced, 851 out of 1,502 passed the Agricultural and Biosystems Engineer Licensure Examination. PRC administered the Agricultural Engineer licensure exam on August 22 and 23 in the cities of Manila, Baguio, Cagayan De Oro, Cebu, Davao, Legaspi & Tuguegarao. The Board of Agricultural Engineering who gave the exam is composed of Engr. Ariodear C. Rico, Chairman and Engr. Juana T. Tapel, Member. From September 6 to September 10, 2018, registration for the issuance of Professional Identification Card (ID) and Certificate of Registration will be done on-line. Visit the official website of PRC (http://online1.prc.gov.ph) and follow instructions for initial registration. All successful examinees should personally register and sign in the Roster of Registered Professionals. The two-day exam covered the following: rural electrification, agricultural processing, agricultural structures and allied subjects, soil and water resources development and conservation, irrigation, drainage and allied subjects, agricultural mechanization, agricultural power, agricultural machinery, equipment and allied subjects. According to PRC Resolution No. 2017-1068, the target release date of the Agricultural Engineer board exam results is on Tuesday, August 28 or in two (2) working days after the exam. In the August 2017 exams, results were released in two (2) working days. A total of 630 out of 1,304 passed the tests. University of the Philippines Los Baños (UPLB) topped the schools with 98.33% or 59 out of 60 passed the exam. In the August 2016 exams, results were also out in 2 working days. PRC named 396 out of 1,002 passers of the Agricultural Engineer board exam. UPLB led the schools after obtaining 96.00% or 48 out of 50 passed the exams. Firstly, I like to say congratulation to all who pass the Agricultural and Biosystems Engineer board exam. Students who don't pass this exam, don't disappoint and come back with double effort and pass this exams. Those students can get help from http://www.motivationletterwriting.com/guaranteed-motivation-essay-writing-service/ to become their study more focus and in the right direction. it is really good news for the student who got into chance to here.When you just get into here you need to click here to get the better service for phd course. The result comes out and people are getting excited but alas there had less seats.When you are get into here http://www.studyabroadsop.com/best-study-abroad-application-essay/ you can get our statement of purpose editing service so easily at any place. The prc borad has been finally published the result to us which we waited for.You need to go to this www.grammarsoftware.info/best-comma-check-software to get the comma checker from us. Congratulations to all the winners as the list is too long so can't name everyone. People are working so hard for this exams so we should must thanks to the college for the best effort they are making in such fields. http://www.mbapersonalstatement.org/how-to-reply-to-columbia-business-school-prompts/ is going to best among all. These results shows great interest of students from agriculture sector. Students can check more info here aboout best writing techniques that can help them in exams. Regardless of the way that with this site you give constantly the care message to the all inclusive community and your beginning and end kind of the information about for the overall public. The material that you write in this have a peek at this web-site is so incredible. I have never scrutinized this kind of the stuff. Such a huge list of passers. Congratulations to all of you. Many students can't afford expensive services of SOP writing. For them, we have http://www.sopwriter.com/our-sop-writing-service/affordable-service-in-writing-medical-school-statement-of-purpose/ look here. Great blog here! Also your web site loads up very fast! What host are you using? Can I get your affiliate link to your host? I wish my website loaded up as quickly as yours lol.